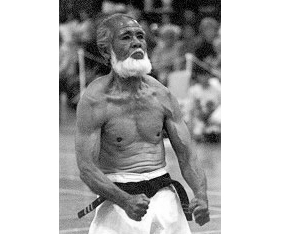 Most Seniors will agree that originally, there was no ranking system or uniform used in the art of karate in Okinawa. If in fact rank was established, it was most likely given through the presentation of scrolls. It was a customary act in the Japanese koryu ju-jutsu schools for these scrolls to be given and each would be inscribed with the "secrets" of the master instructor/ and the style. Some karate styles may very well have adopted this method of designating the ranking member or members of a dojo. There is no doubt Kano, an educator himself, fully understood the importance of the class system in Japanese society and therefore knew it would serve as a valuable tool in his new martial art. Therefore, in 1883 Judo's founder, Dr. Jigoro Kano would begin the modern ranking system when he awarded "Sho-dan" to two of his most senior students, Saito and Tomita. Even after the rank of Sho-dan had been awarded, there would not be any method of distinguishing (other than possibly certificates or scrolls) these men who have been promoted and those who had not been promoted. This would not take place until in 1886, when Kano would require that all of his yudansha begin wearing black obi. Since the judo-gi had not yet been introduced the original obi worn by the yudansha was the traditional wide obi, the same one used to hold the kimono closed. In 1907, Kano would introduce the judo-gi, the predecessor to today's karate-gi and the modern type obi. At this time the students would wear either the white obi used to designate beginners and those not ranked as yudansha or the black obi used to designate those ranked at yudansha level. The kyu system and consequently the wearing of the various colored belts (Kyu grades) would not come into place for several more year, not until Sensei Mikonosuke Kaiwashi introduced them in 1935, when he began to teach judo in Paris. When Gichin Funakoshi traveled to Japan to demonstrate his art of karate in 1917, it was inevitable that he would make contact with the founder of Judo, Jigoro Kano. In 1922, when Funakoshi returned to Japan, he would soon realize just how much he and Kano had in common and the two quickly became close friends. Both Funakoshi and Kano were school teachers, both studied the martial arts and both were interested in promoting their arts to the Japanese public. Being educators, there is no doubt that both of these men understood the importance of systematic training as well as the importance of using a reward system in order to produce the greatest results in their students. On April 12, 1924, Funakoshi would adopt Kano's Yudansha ranking system when he awarded the first sho-dan ranks to Tokuda, Otsuka, Akiba, Shimizu, Hirose, Gima, and Kasuya . The adoption of the kyu/dan system and the adoption of a standard karate-gi (uniform) which was modified and based on the judogi were 2 of the 6 conditions which the Dai-Nippon Butokukai (Governing Martial Arts Authority) required before recognizing karate as a "Legitimate" martial art. Early photographs taken during the training of Okinawan karate student's reveals that the training in the early part of this century would be conducted in their everyday clothes and since instruction seldom included women many times students trained in their underclothes as seen in the photo below. With the Funakoshi's adoption of Kano's ranking system, it did not take long before Funakoshi would come to realize that the ranking system had yet another important feature. In Okinawa the karate instruction was normally conducted with only a handful of students. This made instruction easy to conduct and with a small group of students, (many times training individually with the Sensei), each Sensei had little problem remembering the student's technical ability or skill level. In Japan Funakoshi would soon find that the size of his classes were considerably larger than those on Okinawa. The larger student body would require that he eventually have more assistance in conducting his classes. As the classes grew larger and the need for more instructors increased it became of paramount importance that each instructor know exactly what level of instruction to impart to each student. Almost every karate system in the world today makes use of this Kyu / Dan Ranking system. Although the use of the Black Belt to designate dan grades is virtually universal in all karate styles, there is a multitude of colored belts that are used to denote the various Kyu grades within each style. In most karate styles the colors used to identify the lowest kyu grade will be a light color such as a yellow belt. This light colored belt will become progressively darker (brown belt) as the student advances in rank. After talking to many of the Senior ranking karate men in the United States (including Hanshi Dometrich) they recount stories of how the belts grew darker as the time in training increased. The students of years ago did not change belts with each promotion as the students of today do, but instead they kept the same belt. The white belt would became green as the student made contact with the grass while training. As the training intensified the grass would eventually die from the contact and the belt would become brown with repeated contact of the bare earth. As the student continued to train the brown belt would eventually grow darker until it became black. As the black belt became older (both the student and the belt itself) and their skill increased the contact with the earth became less, (They were seldom thrown, swept or taken down) the black belt would begin to fade into gray along with the hair of the karate-ka and the belt would eventually continuing fading until it eventually returned to it's original color of white and in a sense the belt as well as the student had traveled full circle. 1. Mudansha: (Kyu-Grade) Term used to describe those student below the grade of Black Belt. 2. Yudansha: (Dan-Grade) Term used to describe those students who have acquired the rank of Black Belt. 3. Kodansha: (Senior Dan Grade) Term used to describe those students who have advanced to the Senior Black Belt level Ranks. 4. Mu-dan: (Beyond Rank) Term used to describe an already high ranking martial artist who abdicate their rank. This normally takes place when the high ranking martial artist has succeeded the senior master of the style. In many cases this person will be referred to as Soke upon the death of the master who may very well have been his father. This persons rank will be suspended and the person will be considered Mu-dan. I have seen very little information in print over the years in reference to the various types of Yudansha belts or obi that are used in many karate styles and therefore I am including the information below. In several of the Japanese and Okinawan karate systems one may see a variety of belt types being worn in the Yudansha grades. It is very common to see both English & Japanese Kanji (as well as other languages) on all belts worn in the Yudansha grades. The writing on these belts will include information such as the rank holders name, organization, rank, style, school, country and/or state. The colors of the letters on the obi may vary, but most often will be done in either gold, white, red or blue and may appear on one end of the obi or both ends of the obi. The writing (in most cases) will be aligned so as to be readable when the belt is being worn. There are no hard fast or certain rules that apply to all karate styles in reference to the types of belts being worn as well as the methods of using stripes to designate the various rank levels. The method of rank recognition is almost as vast and complicated as the styles themselves. Be this as it may, the information below should help those interested in the methods generally used to identify the various ranks and levels of students, instructors and teachers. A solid black belt is the belt most often worn for those members in the Yudansha grades and regardless of the Dan level of the Yudansha they are all considered to be what has become known to be a "Black Belt." The Black Belt has become the universal signification for one who has learned and/or teaches the basic techniques that comprise the systems of karate. Many styles of karate, especially Japanese styles will make use of horizontal stripes on one end of the black belt to designate the level of the Yudansha grade holder. These stripes are normally 1/4 to 1/2 inch wide and will totally encircle the belt. These stripes are usually white especially since many times athletic tape is used, but other colors such as red or gold may be used especially when the stripes are embroidered onto the belt. With this type of stripe system Sho-dan (1st Degree Black Belt) would only have one stripe near the tip of one end of his belt, while a Go-Dan (5th Degree Black Belt) would have five separated stripes starting near the tip of one end of his belt and moving toward the center of the belt. When this type of stripe designation is used even the 10th dan of the style will have 10 stripes on their belt. Most Okinawan styles of karate make use of a separate type of stripe system than does the Japanese karate styles. In most Okinawan styles there are no stripes worn to denote the ranks of Sho-dan thru Go-dan To designate the rank of Roku-dan (Renshi) one gold stripe is worn horizontally on each side of the obi. Two gold stripes are worn to on each side of the obi to denote Shichi-dan & Hachi-dan (Kyoshi & Hanshi). Three gold stripes are worn on each side of the obi to denote a Ku-dan (Kyushi). Sensei Seiko Toyoma, Senior Uechi-ryu stylist was one of the last Karate Sensei to training directly under the Uechi-ryu founder, Kanbun Uechi. Sensei Toyoma serves as the Senior Technical Advisor to the Kenyukai Association.